With the regular season and college championship games in the books, it’s time to take a look at which players deserve recognition for this season’s body of work. 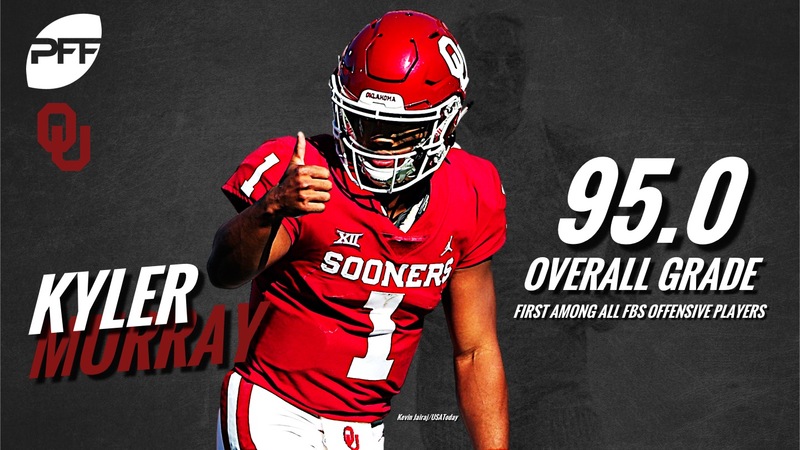 Based on PFF data, Editor Cam Mellor highlights the PFF College team’s top picks for the major college football awards. Make sure to check out our All-American lists, as well as the All-Conference selections for the ACC, Big Ten, Big 12, SEC, Pac-12, AAC. C-USA, MWC, MAC and Sun Belt already announced this week. Look, just give him all the awards already. Murray was the highest-graded offensive player in all of college football this season, thanks to both the top passing and top rushing grade among all quarterbacks. His myriad of throws from both in the pocket and out are second to none this season as he was college football’s most dominant offensive player. Pressured or not, Murray was able to make all the throws, finishing with the second-highest passer rating from a clean pocket (146.4) and the fourth-highest when under duress (109.1). Rounding out his entire skill set, he led all FBS quarterbacks with an 89.0 rushing grade, running for 635 yards on 88 designed carries and forcing 22 missed tackles on carries. Murray’s dominance in the passing attack for the Sooners was apparent game in and game out. He led the nation with 1,387 yards on deep passes (targeted at least 20 yards downfield), connecting on 36-of-72 passes and 15 touchdowns. He attempted a deep pass on 21.2% of his attempts and fielded an adjusted completion percentage of 52.8% on such throws, the second-highest among quarterbacks with at least 60 deep-pass attempts. Perhaps the most important and influential factor in Murray’s development and success this year, is the fact that he was doing it with a lackluster defense on the backend. He had to put up points and the risks he took were calculated, knowing full well that once the Oklahoma offense wasn’t on the field, their defensive unit in Norman finished as our 99th-graded unit. For comparison, players in contention for the other major awards as Murray such as Tua Tagovailoa and Dwayne Haskins each had top 40 ranked defenses and could push the envelope a bit more on offense, knowing that they could count on their defense to limit the opposition. 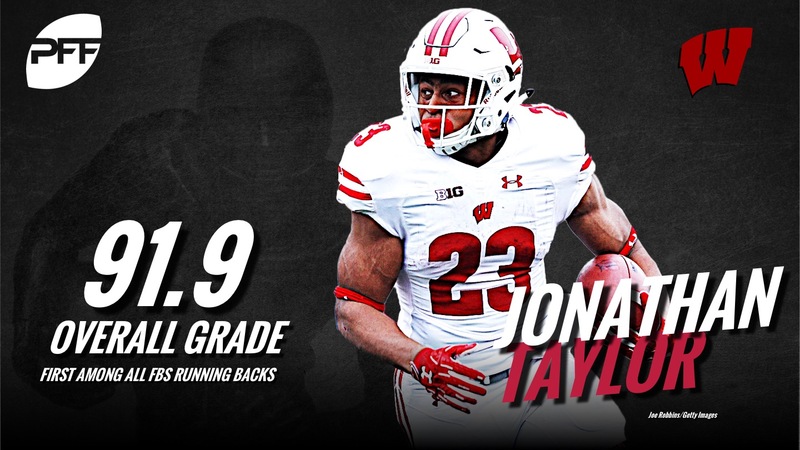 Taylor is the nation’s highest-graded running back, achieving his high grades with successful run blocking in front of him but generating the second-most 1,175 yards after contact. In fact, only 14 running backs had more total rushing yards than Taylor had on the ground as he averaged 4.21 yards after contact per attempt. He forced 58 missed tackles on 279 carries and combined for 87 first downs and touchdowns, a figure that led the country. He was an equal opportunity rusher as he gained over 100 yards rushing to each gap and over 360 yards around each end of the line. No FBS receiver was better at hauling in deep passes this season, leading the nation in receiving grade on throws targeted at least 20 yards downfield. Isabella hauled in a staggering 705 yards on deep shots, on just 14 receptions, good enough for an average of 50.4 yards per reception. That’s over half the field on a single reception! Isabella led the nation with nine receiving touchdowns on deep passes. 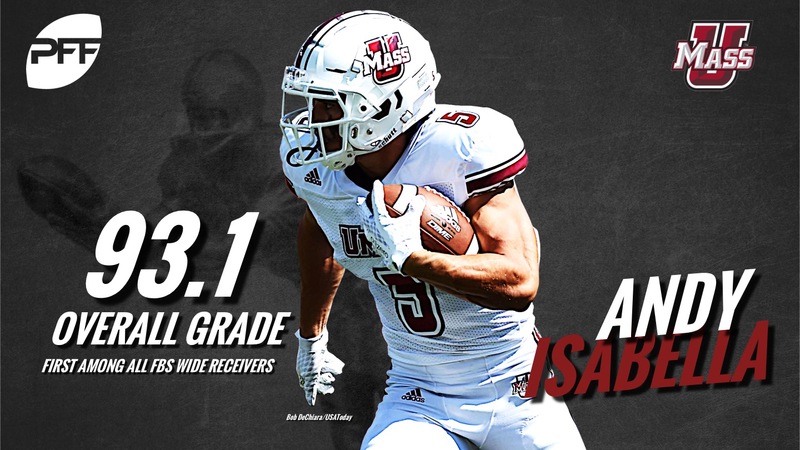 On all passes, Isabella’s 4.16 yards per route run was the top mark in the nation among receivers with at least 200 snaps in route this season, a figure that ranks fifth all-time at PFF, behind Rashard Higgins (2014) – 4.54, Amari Cooper (2014) – 4.25, DaVante Parker (2014) – 4.25, Michael Gallup (2016) – 4.34. 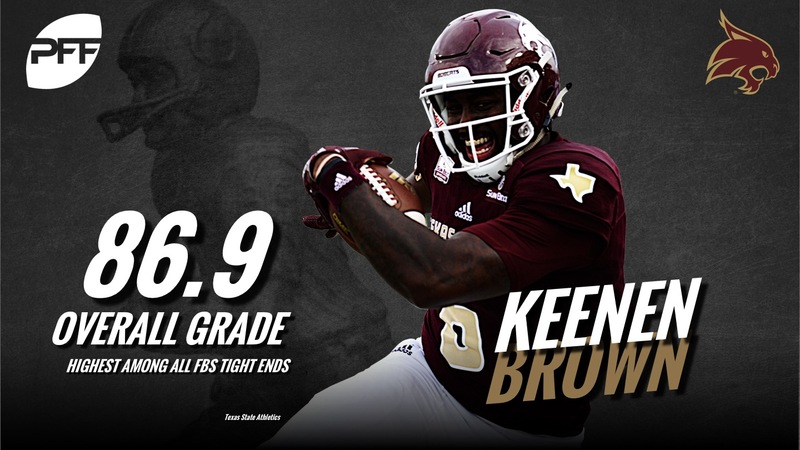 For all intents and purposes here, Brown should have been a finalist for the Mackey Award, and likely would have been had he not played in the Sun Belt for Texas State. Brown graded out as the best tight end in all of college football as no tight end was able to do what Brown did after the catch this season, ranking first among all FBS tight ends with 24 missed tackles forced. 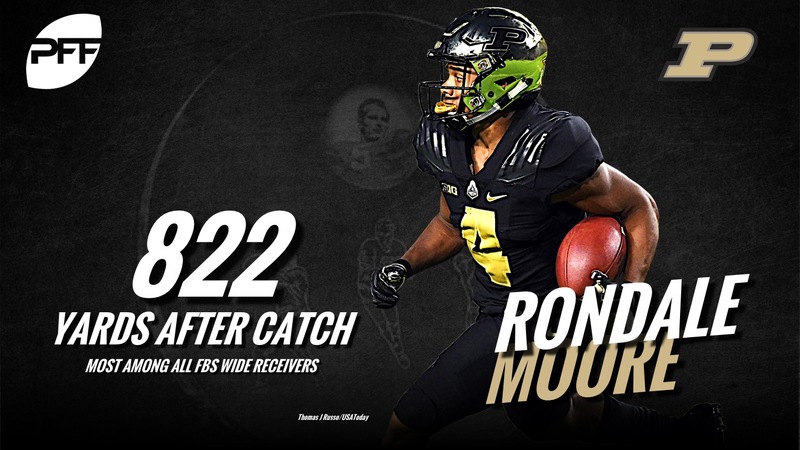 He hauled in a combined 27 first down and touchdown receptions, racking up 580 yards on 54 catches while he also had the nation’s seventh-highest run-blocking grade among tight ends. Williams realistically should be considered for the Heisman Memorial Trophy given his dominance this season. He finished the regular season as the highest-graded player on offense or defense and was the highest-graded defensive player by some margin. In total, he accumulated a ridiculous 43 total QB pressures rushing from the interior of the line, a number that included 24 combined sacks and hits to lead interior defensive linemen. 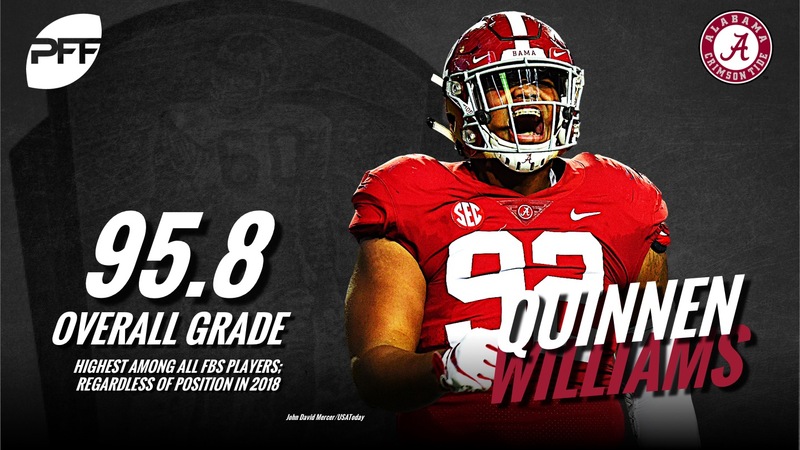 His 56 total tackles are equally impressive, as is the fact that he only missed two tackles all season long and his range in both run defense and when rushing the passer was evident no matter which Alabama game tape you threw on this season. 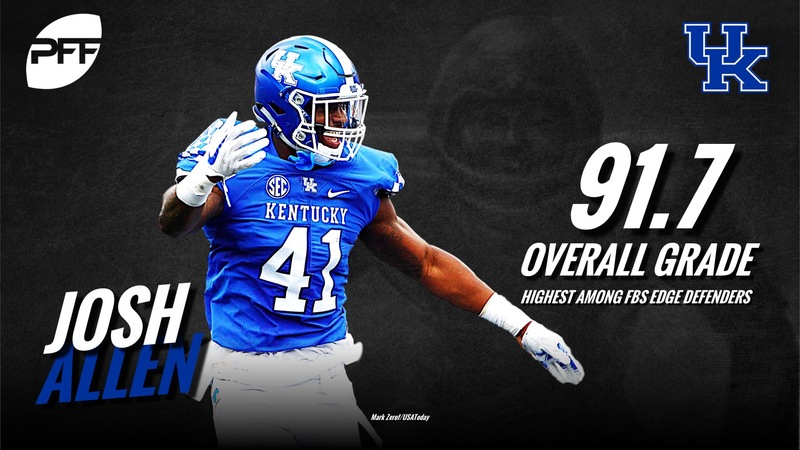 Allen is the nation’s top-graded edge rusher, playing in a unique role along the line and off-the-ball for the Kentucky defense. Proving to be incredibly difficult for offenses to contend with, Allen was able to compile 51 total QB pressures on just 232 pass-rushing snaps that included 14 sacks and nine QB hits. Dropping back into coverage on 141 snaps, Allen proved he could keep up with speedier running backs and even slot receivers as he allowed just 13 receptions on 19 targets and didn’t allow a touchdown while recording three pass breakups of his own. Another spot where we’d like to see another finalist as Murphy finishes as the nation’s highest-graded cornerback. 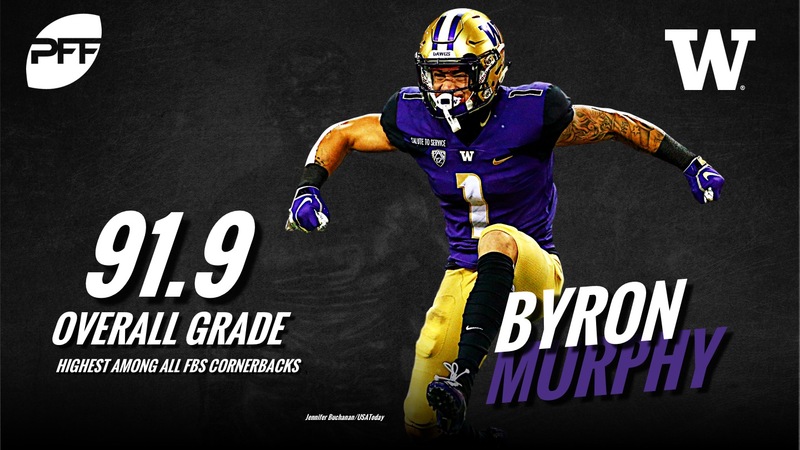 His coverage grade of 91.9 also led the nation’s cornerbacks as he recorded the Pac-12 Championship Game’s lone touchdown on a pick-six to put the exclamation point on his season. By definition, the most versatile player must be someone who demonstrates a strong ability to contribute to their team in a variety of ways, in multiple facets. Moore not only dominated on the receiving end of David Blough’s passes this season, but he also put forth strong run-blocking grades, had 203 yards and three missed tackles forced as a runner while he also returned 42 total punts and kicks for 681 yards. A true freshman season for the ages, the scary part for Big Ten defenses and special teams units is the fact that he’s just getting started. Tracy did not miss an extra point in 2018, finishing a perfect 38-of-38 while he also holds the advantage in total field goal make percentage (86.2%) over Matt Gay of Utah. He connected on 9-of-12 field goals from at least 40 yards out and didn’t miss a single attempt in the 20-29 yard ‘chip shot’ range. The nation’s highest-graded punter, Mann knocked 29 of his 47 punts inside the opponent’s 20-yard line and averaged the nation’s best 45.0 net punt average. In total, he allowed 19 punts to be returned but averaged the third-highest hangtime at 4.34 seconds, relenting only 5.8 yards per return on average.